EDITOR’S NOTE: The story about Phil Ming Xu’s asserted cooperation with the government appears below the subhead. We’ll lead with the news of extension of the claims deadline for WCM777 victims. If you’re a victim of the World Capital Market/WCM777 Ponzi- and pyramid scam shut down by the SEC last year, you now have until Dec. 24 — Christmas Eve — to file your claim. The original claims deadline had been Nov. 9. On Oct. 26, court-appointed receiver Krista L. Freitag asked for an extension. U.S. District Judge John F. Walter of the Central District of California granted the request on the same day, extending the deadline until Dec. 24 and empowering the receiver to take other actions “to increase the number of investor claims submitted,” according to the court docket. 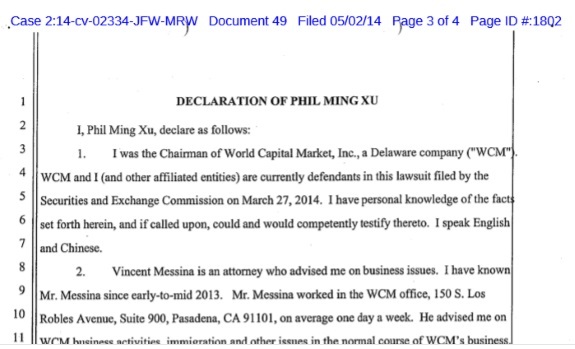 The opening of a Phil Ming Xu declaration originally filed under seal in April 2014. The seal was lifted at the request of an investor and after federal prosecutors did not object. Messina is alleged to have come into possession of $5 million in proceeds from the WCM777 fraud, some of which allegedly was directed to International Market Ventures, a company operated by Gary Messina, his nephew. Gary Messina formerly worked as the chief information officer for the Bureau of Citizenship and Immigration Services, an arm of the U.S. Department of Homeland Security. Messina has been ordered to return the $5 million, and IMV — the recipient of a transfer from Messina — is on the hook for $941,505 of it. Walter lifted the seal in an order dated Sept. 14, after the office of U.S. Attorney Eileen M. Decker of the Central District of California did not object. Precisely what Decker’s office is investigating remains unclear, although tens of millions of dollars are alleged to have flowed through WCM and related entities. It is not unusual for Ponzi schemers to rub elbows with famous politicians as a means of trying to sanitize their scams, Scott Rothstein being an infamous example. How dangerous is the world of HYIP Ponzis? Well, the Press Democrat of Santa Rosa, Calif., reported in January 2015 that investigators believe a murder might be tied to WCM777 and a companion scam known as Kingdom777. Ming Xu also was concerned about being harmed, according to his now-unsealed motion from April 2014 to file under seal. He did not list a source of harm, but with so much money and so many tentacles involved, it could be anybody — from a person down the street to a person overseas. As for what Ming Xu said in his actual declaration docketed in May 2014 and now public . . . If you were pushing WCM777 during hotel pitchfests and in your church and continue to have doubt WCM777 was a Ponzi scheme, put those doubts to rest. The huckster conceded the Ponzi in his declaration, while alleging Messina also knew it was a Ponzi. On or about February 27, 2014, Mr. Messina sent me a document to sign stating that the transfer of the $5 million was a non-recourse loan payable in full in five years. I executed the loan document after being advised to do so by Mr. Messina. The money I transferred to Mr. Messina was not truly a loan and the two-line document purporting to be a loan agreement is false. On or about March 20, 2014, I wrote and sent a letter to Mr. Messina, wherein I demanded return of the $5 million transferred from the ToPacific bank account into Mr. Messina’s IOLTA account for SEC settlement. Mr. Messina refused to return the monies. I have subsequently learned that Mr. Messina has disbursed some of these funds to an entity, International Marketing Ventures, a company that is controlled and operated by Gary Messina, his nephew. It is unclear if Ming Xu currently is cooperating with the government and how much his asserted cooperation in April 2014 helped in pursuit of the WCM777 case or other cases. What is clear is that the WCM777 story has included a series of bizarre developments — everything from a pledge of love for the people of Peru written on the letterhead of a suspended California company and a recitation of the importance of “blood moons” to the appearance of a “Jesus sword” and the apparent involvement of a former CIA operative. Who constituted the “Josephs” and how they would “bless the world” always has been unclear, as has the nature of the purported “training” they required. This particular segment of the WCM777 narrative is deeply strange in other ways. For example, a former reputed member of the Mafia named “Dr. Bruno Caporrimo” is part of the narrative and a purported Ming Xu associate. So is a purported California university known as the “Joseph Global Institute” of which Ming Xu purportedly was “dean” and Caporrimo reportedly was “chancellor.” As the PP Blog reported last year, one promo for the institute appeared to rip off video footage from Liberty University, a well-known Christian college in Virginia. The Joseph Global Institute previously planted the seed it was affiliated with Harvard. Some people have blamed the “Innocence of Muslims” film for the Sept. 11, 2012, attack on U.S. outposts in Bengazi, Libya, that killed Ambassador Chris Stevens and three other Americans. The issue has dogged former Secretary of State Hillary Clinton, now a Democratic candidate for President of the United States. The WCM777 Ponzi-scheme story has proceeded through all sorts of tortured twists and turns, creating nonfiction that reads like fiction. Although it not unusual for bizarre narratives to accompany Ponzi schemes, the narratives surrounding WCM777 are particulary bizarre — and Americans should be concerned and follow developments closely. Interesting, so thats how Xu could promise green cards to big investors. i expect immigration fraud and corruptions charges. Can you do a tally on what Allen Matkins has billed to date on this case? Same question on Krista Freitag, the Receiver? Are you aware that Ming Xu was arrested in mainland China, was allowed out on something similar to house arrest, and then re-arrested? He is presently incarcerated according to my sources. A previous poster said something similar months ago but you were unable to get any confirmation from the SEC or Receiver regarding Ming. The biggest joke is some guy named Caporrimo being “mobbed up”. What’s next – Ming was extorted by the Abomiable Snowman Big Foot?